Do we need a new type of leadership for the Fourth Industrial Revolution? Yes! We have heard it before: the Fourth Industrial Revolution is here to stay and is moving faster than we thought. The real question is if Leadership is also adapting to a new business model. • The Latest CEO-to worker pay ratio recorded in the USA was (ready?) 321:1! In spite of the devastating recession of 2008, the growing public debate about inequality CEOs pay-check is getting bigger. To add insult to injury, remarkably, without any clear correlation with company performance and sustainability. • As demonstrated by Jeffrey Pfeffer latest book “Dying for a paycheck” the deaths related to stress, toxic workplaces and terrible management practices are on the rise. In China alone, more than 1 million people per year have died. • Organisations, institutions and societies are going through a major crisis. Performance continues to decline whether measured through Return on Assets or Return on Invested Capital; U.S. firm’s Return on Assets has progressively dropped 75 per cent since 1965, despite rising labour productivity. • The average life expectancy of Fortune 500 companies has steadily decreased from 75 to 15 years in the last 50 years. Furthermore, data shows that only 25 per cent of the workforce is passionate about their work, despite the plethora of techniques and resources spent on Learning and Development (L&D) and global figures for engagement show that 80 per cent of employees are less than fully engaged at work. As you can see from the sample of this data, we have a problem: something is broken here and the old leadership model does not work and it is actually getting worse. So, the Big Shift in management and leadership approaches is not a nice to have but a truly needed and long overdue change. We know that every organisation today has to deal with increased volatility and complexity, the pace of change, technological revolution and changing demographics of the workforce. For example in the next 10 years, millennials will form a majority of the workforce and they refuse to be micro-managed. There is no sector, industry or country immune to this change. What do leaders/employees and organisations need to do to survive and thrive in the Fourth Industrial Revolution? An organisational culture is a reflection of leaders’ ‘Culture’, ethics (or lack of it) and consciousness. The impact can be observed as a ‘ripple effect’ throughout teams and the organisation, with multiple and accelerating impacts upon communication, employee commitment, ability to innovate and other aspects of performance. Managerial effectiveness is not a stand-alone measure, it is the starting point of a well functioning organization. Still, there is an illogical dynamic. Even as the link between superior people management and better performance becomes clearer, there is scant progress. In the UK, for example, a report by the Chartered Management Institute in 2012 found that some 80% of managers in high-performing organisations report that their own line manager is effective or highly effective, compared with 39% in the poor-performing workplaces. Yet the overall proportion rating their managers as ineffective was over 40%! Would we tolerate such a failure rate in any other profession? Recently, the Chartered Institute of Personnel & Development reported that the quality of management had not improved in the past decade, this is somewhat depressing at so many levels. Approaches to maximise productivity, innovation and employee autonomy were ‘still not the norm’. What is needed, therefore, is a complete Management Shift in order to enable organisations to survive and thrive in the Fourth Industrial Revolution. The most substantial improvements start but do not finish with the individual leaders: their beliefs, conduct, ways of handling people and understanding of strategy. A key part of the changed mindset is to perceive the organisation as a dynamic entity, not an inert set of assets. You also need good intelligence. Leaders need to understand their own weaknesses and strengths and be in possession of information on how all the business units are operating. On this respect, coaching could be a very effective way to increase self-awareness and reduce blind-spots of managers. The Management Shift needed to adapt to the Fourth Industrial Revolution is divided into two categories: Individual and Organisational. For the Individual Shift, senior leaders and management need to fully understand and learn about their impact on their teams. 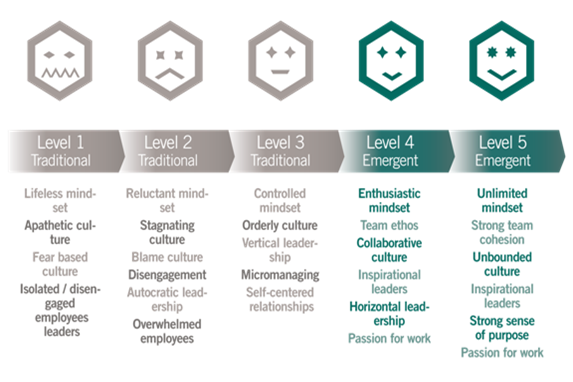 Research supports the concept of Levels of engagement and performance, from Level 1, which is apathetic, through to Level 5, passionate and unbounded (Figure 1). This Emergent Leadership model draws on social neuroscience and complexity theory, as well as empirical research on employee engagement and organisational behaviour. Each Level is characterised by distinct mindsets and behaviour. With coaching and facilitated discussion, people can improve. A significant change occurs moving from Level 3 to Level 4; this is the key moment of the Management Shift: the point at which high-performance begins. Level 4 is the level where Leadership 4.0 emerges. This is leadership need for surviving and thriving in the Fourth Industrial Revolution. How can leaders and organisations shift to a higher level of performance and success whilst facing challenges of the Fourth Industrial Revolution? The concept of such developmental Levels is also applicable for organisations. Here, because one is dealing with a multi-dimensional entity, the 6 Box Leadership Model explains how to encompass all major elements. 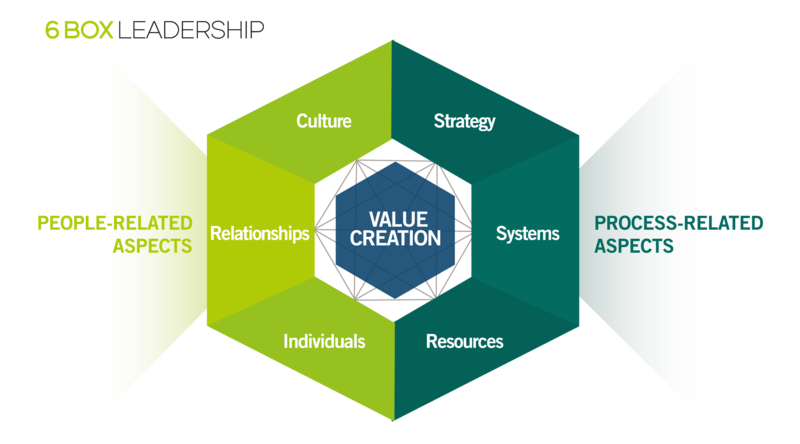 Three of the six dimensions relate to people – Culture, Relationships, Individuals; and three to business processes – Strategy, Systems, and Resources (see Figure 2). Key to putting this together is to understand the links between personal and organisational development. When people and their teams become more empowered, this, in turn, ripples out through the organisation, transforming under-performing teams and units into highly engaged and efficient operations. For example, at a City of London insurance company, the 6 Box Leadership analysis revealed a strong culture and work ethic, but also a tendency towards short-termism and risk of employee burn-out. Implementing the programme helped improve training programmes, boosting engagement and performance. A US management consultancy transformed its performance using the Management Shift, doubling its headcount and increasing revenue five-fold some in 18 months. At a FTSE100 company, use of the 6 Box Leadership Model revealed ways to improve engagement and innovation. Two years later, there was a 33% increase in revenue and an increase in net profit of 213%. One National Health Service Trust in the UK used the approach to reduce ‘command and control’ style leadership with a more participative style. This led to a considerably more people-focused culture, with the Clinical Director reporting a better organisational climate and treatment for patients as a result. Organisations can transform themselves from under-performing to high-performing, but only if they shed the dated notion that employee engagement is a side-issue or ‘the soft stuff’. Research now shows that a comprehensive approach to the development of leaders, their teams and the wider organisation can have a dramatically positive effect. In conclusion, the Fourth Industrial Revolution has a disruptive effect on leadership: the old model, the carrot and stick, the toxic leadership and organizations based on fear and control do not work. A new model is needed, a model where leadership has not only a well functioned Radar to understand what is happening globally but also a moral Compass to steer the ship in the right direction, guided by ethical choices and responsibilities . Not a change: a real shift to become a genuine humane leadership and where trust and respect permeate organizations. Pfeffer J. (2018)“Dying for a pay check: How Modern Management Harms Employee Health and Company Performance – and What We Can Do About It”, HarperCollins: New York. Hamel G. (2012) What Matters Now: How to Win in a World of Relentless Change, Ferocious Competition, and Unstoppable Innovation, Jossey-Bass, San Francisco. Hlupic V. (2018) “Humane Capital: How to Create a Management Shift to Transform Performance and Profit”, Bloomsbury Publishing: London. Gallo P. (2018) “The Compass and the Radar: The Art of Building a Rewarding Career While Remaining True to Yourself, Bloomsbury Publishing: London.